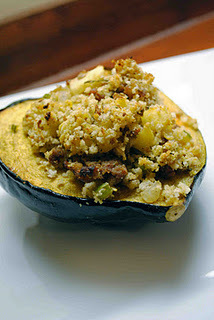 Stuffing and squash...two of my favorite things about Thanksgiving. This recipe from Prevention RD, originally on Sunny Side Up in San Diego, merges those two loves. I've made a similar recipe before with a slightly more traditional form of stuffing, but the stuffing inside of this recipe is different, made with panko bread crumbs rather than bread cubes. One of my favorite things about preparing this dish was the way it made my house smell, with a very close second being the extra stuffing that didn't fit inside the squash, which I baked in a ramekin and ate on its own. Combine the melted butter, garlic, and 1/4 teaspoon of sage. Brush the inside and outside of each squash with the butter mix. Place the squash on a baking sheet, cut side up, and roast at 400 degrees for 50-60 minutes, or until fork tender. In a large skillet over medium heat, brown the sausage. When the sausage is browned, remove it from the pan and set it aside on a plate lined with a paper towel. *At this point, we deglazed the pan with a splash of apple cider. Add the onions, celery, and mushrooms to the skillet and cook for 3 minutes. Add the apples and cook for another 2 minutes. Return the sausage to the skillet and remove from the heat. Season with the remaining 1/4 teaspoon of sage, salt, and pepper. Stir in the panko and parmesan. Add the egg and stir to combine. Divide the stuffing evenly among the 4 squash halves. Return to the oven and bake for an additional 20 minutes.